The all-time film noir classic. Fred MacMurray stars a Walter Neff, an insurance salesman. He is fine living his every day life until he meets Phyllis Dietrichson (played by Barbara Stanwyck)a woman of questionable morals. When Walter falls in love with Phyllis she sees a way out of her loveless marriage. She convinces Walter to con her husband into purchasing accident insurance. 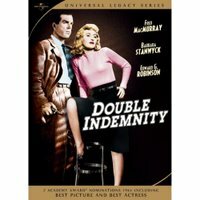 Once Walter tricks Mr Dietrichson into signing the policy he convinces Phyllis to make her husband's "accident" occur on the train to cash in on the double indemnity clause. They seem to get away with the plot until Walter's conscience gets the best of him. He also learns that Phyllis may not be the person she seems to be. As his life begins to unravel he sees that he has been duped and tries to set everything right. I love this movie. The story is interesting and relevant even today. Stanwyck and MacMurray are wonderful and believable in their roles. The only complaint I have is with the fake looking blonde wig Stanwyck wears in the film. However, I guess it was month into filming before Billy Wilder, the director, decided it looked stupid and at that point it had to stay on. Although in a way it helps add Stanwyck's mystique. A definite must see for all classic movie fans.